Oh my gosh, we're back! I'm sure you missed us. You did, right? As some of you have guessed, I'm sure, KMWW took off the past couple of days so that I could move, and now that the move is over and done with (and hopefully not to be repeated for a good long time, thank you very much), we can get back to some semblance of normalcy over here. But before we let the world slide back into the usual, let's talk about Buffy the Vampire Slayer, and how life is the big bad. For those of you who haven't seen the show but who have probably heard about it (this is the internet, after all), it goes like this. Buffy Summers (Sarah Michelle Gellar) is the one girl in all the world chosen to fight the vampires, demons, and the forces of darkness. She is the Slayer. As such, she has super-strength, awesome fighting skills, and is crazy hard to kill. She lives in Sunnydale, California, which just so happens to be home of the Hellmouth, a literal gateway to hell, and attracts all sorts of nasties that are always trying to open the Hellmouth, kill the Slayer, mess people up, eat something human, or all of the above. Buffy, who tries to live a normal life in between slaying and researching the latest apocalypse, can't do it alone. So, she has help from her Watcher, Giles (Anthony Head), and her best friends, Willow (Alyson Hannigan) and Xander (Nicholas Brendan). The four of them work together, often with other addition friends, significant others, and family members, to save the world. But somewhere in there, as you're watching the Scooby Gang (that's what they call themselves) fight yet another monster, you kind of start to realize that the real villain on the show isn't the forces of darkness. I mean, they're bad, sure. There is genuine evil and these characters are fighting it. But that's not the real villain that needs to be defeated. Or rather, the evil bad guys aren't the ones Buffy feels a need to save herself from. Nope, that big bad is life itself. Whoa there, I hear you saying, that's kind of intense and deeply depressing for such a campy show. What gives? Well, I answer, it's not super surprising to think that this show has a sad and deep core principle. I mean, it is written by Joss "Everyone You Love Dies" Whedon. But more than that, I think the very campiness of the show is what allows it to explore this idea. Because where else do you see someone actually fighting literal demons, only to go home and worry about whether or not she can pay the mortgage? The theme is present all the way throughout the show, starting with their high school, where the Mouth of Hell is literally underneath their school, so when they say "High school is hell," they mean it. But it grows and develops as the show goes on. In a weird way, the greatest villain is never the evil creatures that Buffy has to fight. Those demons or vampires or whatever are evil, sure, but they're evil because they're evil. Because they were always going to be evil. They're demons. Yeah, there are a few exceptions, but for the most part, they're just doing what nature tells them to do, and Buffy's just doing what nature tells her to do. That's not the messy part. The complicated stuff is all squarely in the human realm. Buffy spends so much time saving the world that she's failing all her classes. Her mother, who spends the first few seasons unaware of her daughter's extra-curricular calling, grounds her for her erratic behavior. She loses touch with her dad, because she can't always take time off from slaying to meet with him. She can't get a boyfriend who doesn't know about things that go bump in the night because he'll wind up dead. She loses friends, some of them die, she's a social outcast, she gets arrested a lot... I could go on. And that's only in the first few seasons. 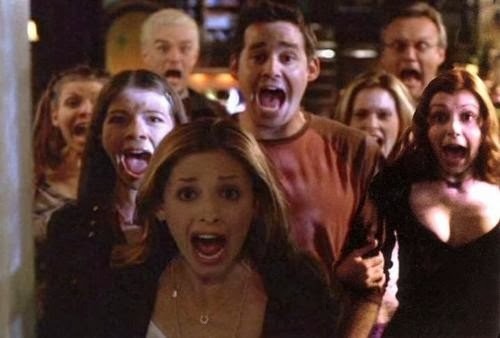 As the show continues, the consequences of Buffy's calling become all the more clear. At college, she tries to be a normal student, but her college options are limited to ones in town, so she ends up at UC Sunnydale. And then she tries to date a normal college guy, only for him to wind up being part of an underground military operation experimenting on demons. It's a bad scene. Then magic grants Buffy a little sister, Dawn (Michelle Trachtenberg), right before their mother dies of completely natural causes. Buffy, now about twenty years old, is faced with taking the guardianship of her little sister, supporting them both, and still trying to save the world. She drops out of college, gets a menial job, deals with her sister's behavioral problems, tries to learn how to parent while still in the process of grieving... I think you get the picture. It's intense. The point I'm making is not that Buffy is secretly a dark and deep hole of depressingness. That's not the point at all. Instead, I'd like to pose the idea that all this sadness, this life being the big bad thing, is good for you. Good for us. Much better for us, I think, than if the big bad were something external. Life is hard. That seems like a really simple statement, but it isn't. Life is full of complications and it's messy, and sometimes it means that you have to completely change your idea of what constitutes a "good" one in order to stay alive and fed and ideally clothed and sheltered. Life is hard. But that doesn't mean you should give up. You see, if all we saw on Buffy was external evil forces trying to stop her and take down the Hellmouth, then, first, the show would feel incredibly shallow and silly, and second, it wouldn't have any higher meaning. External evil that needs to be defeated, but can be defeated without any cost to myself or the ones I love? No problem! Evil that needs to be defeated, but isn't actually the source of the real pain and frustration in our lives? That's another story. We need Buffy to struggle with life because that's how we can learn how to struggle with her. I honestly learned more from that show about moving on and keeping going and continuing to fight when I saw Buffy forgive her mother for reacting so badly to her Slayerness and when I saw Buffy break down and cry over another lost friend and when she was scrounging to pay the electrical bills than when she fought a demon or saved the world. It's the little things, because the little things are often the ones that matter most. So, this week, as you go about your daily life, remember Buffy and the real big bad. Because if life is the big bad, then that means that we can fight it, and we can win.